So a little game called Persona 5 was released here yesterday and our household has already sunk a couple hours into it (and we’re loving it so far). Playing it — as well as the excitement leading up to the release — made me think of the whole series and how much it has affected me as a gamer and all that nostalgic jazz. I first learned about the series in the late 90’s while I was crouched in the video game aisle at our local Blockbuster Video, trolling through so many choices (it wasn’t a lot… but back then it was SO MANY) to find something that looked appealing to me. I came across a game called Kartia, but when I turned the box over to look at the back to hopefully glean some more info about the game I just saw… ads for more games. One of them caught my eye though. It was called Revelations: Persona and the logo was written in this red, badass font. There were a couple of screenshots and images of a few of the characters. The only one I definitely remember seeing was Reiji (who was known as Chris in the North American translation) and I absolutely fell in love with him right then. He’s wearing no shirt under his school uniform jacket and a collar with a giant chain on it??? HOW COULD I NOT LOVE HIM? Hehehe. Well, Persona was nowhere to be found in my Blockbuster… so I knew it would be my quest to find it somewhere else. I adored the game overall, even with the questionable translation issues, the choice to leave out a whole giant sidequest and some of the odd changes they made for the North American version — and I think it’s because Persona was my first real foray into what else games — especially RPGs — could be. I had played Final Fantasy VII, which was my introduction to the genre and had picked some others up here and there afterwards, but they all had that sort of “fantasy” flare. FFVII did have some futuristic elements (I LOVE YOU, MIDGAR) but overall it leaned towards fantasy for me and I had always been a fan of things that Revelations: Persona actually pulled into their games. Alternate universes, occult-related backstories, people’s own inner demons…… aaaaand contacting enemies by dancing seductively for them! One of my absolute favorite aspects of the game was the soundtrack. I was used to sprawling epic fantasy-ish tracks — which were always good, but never exactly my taste (that’s not to say I didn’t like them, but I wouldn’t listen to them as much as other game soundtracks). 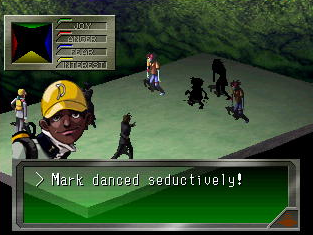 Persona though, I was floored when I heard the music. The battle theme got a little repetitive due to the number of random encounters (did I mention Revelations: Persona was long and got kind of difficult in spots — when I finally beat it, I wrote on the plastic cup I was drinking out of at the time: PERSONA CUP! And then the date and time I beat the game.) but so many of the other songs made up for it (not to say the battle theme is bad, I love it — but I heard it SO MANY TIMES) and I’ve listened to them hundreds of times by now. They helped to create the exact weird/unsettling atmosphere of the game that I love so much and were just a style I had never heard before in a game — I mean, some of the tracks were downright creepy. Others were positively gorgeous and some made me want to dance — it was just a mix of everything I love. The soundtrack was written by Hidehito Aoki, Kenichi Tsuchiya, Misaki Okibe and Shoji Meguro (who would continue composing works for the series from Persona 3 on) and is definitely one of my favorite video game soundtracks of all time. Below are some of my favorite tracks — if I don’t just start linking them I’m gonna go even more crazy rambling about how much I love the whole thing and then never get there. And I couldn’t leave out the Velvet Room theme. AND SPECIAL SHOUTOUT TO THE PHARMACY SONG TOO, OF COURSE. When the game was re-released for the PSP in 2009, a lot of the songs were remixed, redone completely or scrapped for new songs. It was a great soundtrack (and an amazing remake/port of the original game — especially keeping with a lot more of the Japanese ideas/names/etc. from the original) but it never reached the level of love I had for the original soundtrack from the ’96 Revelations: Persona. I think it was because that game and the music had such an impact on me that it will always hold its own special place in my fandom heart.